I found wooden disks for ten cents at a craft store and decided to see how well Sharpies would write on them. The markers bled a bit, but by varying how hard I pressed, I could control the bleed somewhat. Applying the lighter colors before sketching any black lines works best, or else the black will bleed like a victim on CSI. Applying a light coat of spray acrylic before drawing also stops future bleeding, but it will turn the wood a couple shades darker. Eek! You watch too much CSI! I know, Mom! I know! I try to quit for fear I'm corrupting my mind, but I loooove detective stories. Cute! I would wear it as a necklace. How adorable! And, I too, am hooked on fictional and non-fictional criminal investigation shows. So much so that my blog is called "Scene of the Grime." Come see me sometime and thanks for sharing your wooden disk creativity! Happy 2011! COOL! If I could doodle I'd do it. When I saw your tweet I knew you would come up with something great, but even then when I saw these I was completely over the top impressed. So lovely! I just used some of these little discs (painted with doodles) to tie on Christmas packages. I can't wait to try Sharpies! Yay! Thanks for the excellent idea. I love them! So cheery and bright! So adorable! I love the design! It's a wonderful idea - thank you for sharing! I love the designs you made! These look great! 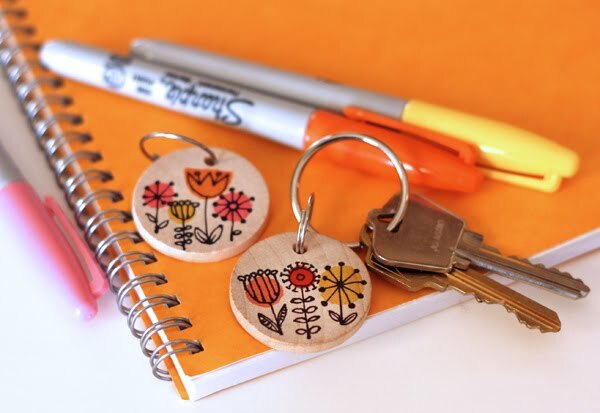 So simple and yet they make something (your keys) looks so much more cheerful and pretty! Looks great. Also works well on wooden beads for an interesting addition to a necklace. Wow those are so sweet and colorful!! If you like detective stories, maybe you've seen the show 24? My husband and I have been watching through all the seasons on Netflix. I am not sure how old the show is, but it's pretty good! How cute! You are seriously so crafty- obviously! Very cute! These would make great gifts! I LOVE these...and your idea... almost as much as i love sharpies! Great job! ps I am loving your blog! Im sure Ill be commenting on it quite a lot! Those are absolutely adorable! Love your design! Were the discs pre-drilled? These are totally adorable! I'm in love. And ten cent disks and sharpies? You can't beat the supply cost! Super cute idea. My girls would totally love these for their back packs too! I love your little flowers! They remind me of a vintage mug I have in my cupboard. So sweet. So cute, what a great idea! How adorable! Love the sweet little design you've made here. Cute! Hey, what do you know? Good eye! Oh, for heaven's sake! These are SO much nicer than those plastic key rings or even those paper circles with the metal band. I've got a load of wooden disks, too. Thank you! Okay, I cracked up at your CSI comment...we're Ion television fans and watch all those detective shows...it is crazy. Anyway, have you sprayed your finished products with acrylic? Did they bleed? Can you let us know which crafts store you found them in? I'd love to make some of these for gifts. Seriously - how cute are these. We moved a few months ago and I have been looking (with no luck) for a new key chain to replace the paper tag one from the seller. This is perfect. I'm off to do some drawing (because you know I have all the needed supplies in my stash). Love it! What about spraying a thin coat of clear acrylic before drawing, to prevent the Sharpies from bleeding? And then again after. Now, that is so cute!! Gorgeous! I wonder where I could get those wooden discs in Australia? They'd make gorgeous buttons as well. I love those! Such a great idea! Clever. Cute. I heart Sharpies. My daughter is an industrial design major and did two internships with Sharpie in Chicago this past year. Wondering what size these disks are. About 1" maybe? how cute cute cute are those!! The disks are 1.5" in diameter. I got them at Tom Thumb, a local hobby shop. They didn't come with holes in them; I drilled them. I could apply a coat of spray acrylic before or after drawing on them, but when I tested my spray stuff on an extra disk, it turned the wood considerably darker, which was an effect I didn't care for. Soooooo Cute. Your very clever, where do you find the time? Wow! That is so cool! These are great! Now I have a use for all the little plugs that are left when we drill something using a bore bit. I love these! Thanks for the continued inspiration. - thanks for the inspiration! While my husband watches CSI I read blogs that teach me how to keep Sharpies from bleeding. Fake bleeding on CSI, real bleeding on How About Orange. I can't wait to give this a try. Yours are adorable! how cute!!! I see these as ornaments for a woodland tree at christmas too! These are super cute! So many uses...love the magnet idea!! Love your flowers. And the orange and yellow Sharpie adds just the perfect touch! Such a fun idea. I will have to look for some wooden disks.I have so many sharpies,but now I see I will need more colors. You are so clever...and a great artist..love your vintage flowers. Fabric pens work well on wood - at least for drawing doll faces on wooden clothes pins. Hey there! I just wanted to let you know that I thought these were the cutest thing ever and decided to feature these on my blog tomorrow morning. Don't forget to swing by and check it out! p.s. I am following now!! Just discovered your site and I have been all over--I LOVE,LOVE,LOVE it!! I refurbish vintage lamps and lampshades in my shop. While I am a bit bogged down with the lamps at the moment, I am also looking for fresh ideas for upcoming lampshades. My mind is reeling from the lampshade possibilities I have found on your blog in the last 30 mins..! Let me know if you would like more info (as if I have not gushed enough! ), either about my experience with the product or suppliers. I might be able to save you some legwork. Again, LOVE your blog. Can't wait to see more of your wonderfully creative projects! yay!!! glad this came from you! i saw a photo of it on pinterest and pinned it in my crafty (things i want to try) board. Wow, these are so cute! I hope you don't mind, I featured this post on my blog! Wow, I have got to find me some of those disks. Yours are very cute!! So cute, I love the Idea and the design!! a really great and cute idea! Hey Susan, that stuff sounds COOL. I might hit you up for a supplier if I come up with a project for it someday! I'd love to do this with my second graders. I might have to use larger disks. Thanks for sharing! You are so creative! What a gorgeous little keychain. If I can find some of these in a heart shape I think I'll knock out my Valentine's crafting in no time! And how cool would these be as magnets! Where did you find these?! I got them at a local hobby store called Tom Thumb. The link to it is in my comment higher up the page. You can probably find them at other craft stores like Joann's or Michaels, or search online. These would be really cute earrings too. I'm hooked. I do something like this to make pins, and I've found that Faber-Castell markers work really well and bleed minimally (especially if you use the fine or smalls). They come in loads of colors (including a sepia set that I adore)and like 5 sizes. i thought this might amuse you.